In my last diary, I gave an example of an uncommon spam message. But attackers have always new ideas to deliver their malicious content to us. Here are two new examples. October being the Cyber Security Awareness month, more examples are always welcome. Server 32.80.249.78 is not responding. Attached to this mail, a malicious ZIP file with a .pif file inside. The file is in fact a PE file (MD5: 2aa0d2ae9f8492e2b4acda1270616393). The hash was unknow to VT but once uploaded, it was reported as a very old worm, nothing very malicious. The link points to hxxp://thekchencholing.org/.https/www/sharepoint.com/sites/shareddocument/SitePages/Home.aspx/index.php?wreply=YW5keS5nZXJhZXJ0c0BjZWdla2EuYmUN (the site has been cleaned up in the meantime). 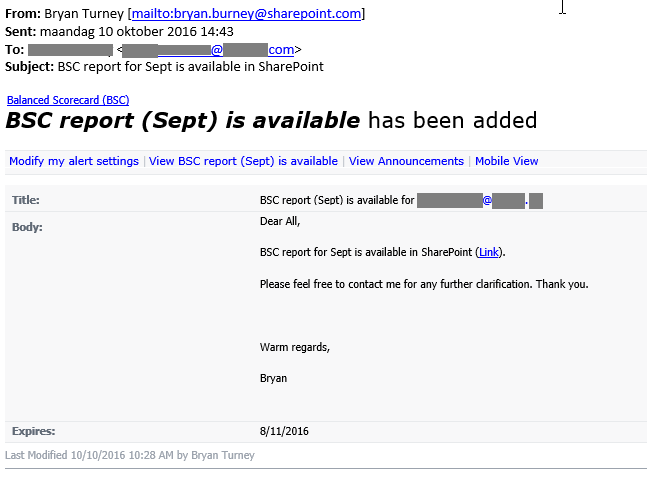 SharePoint is a common Microsoft tool used in big organizations and people could be lured by this kind of message. Most spam campaigns are easy to detect but some messages, when properly redacted, may lure the victim easily. We are never far from an unfortunate click. Stay safe!